Planning for this year’s Biketober has started in earnest. Over the next few months there will be a frenzy of meetings: meetings of the committee variety, meetings for fundraising applications, meetings to ‘let’s have a coffee and chat’, and informal casual encounters with anyone who has something to contribute to Biketober. It will be the premier biking event for everyday cycling in Christchurch, highlighted with the NZ Bike Expo at the Wigram AirForce Museum on the weekend of October 13th and 14th. One of the many successful events at Biketober last year was the Passport Scheme. It turned out that the challenge of getting on a bike to go and visit many or all of the 16 participating (by paid advertisement on the Passport) businesses in return for the chance to win some prizes proved to be pretty popular for many (over 4000 Passports given away). It is really important to have this type of activity in a major festival for everyday cycling. It sends the message that riding a bike is not just a recreational activity. Heading down to the shops to get a few things you need is not only convenient, but fun, and great way to get some exercise at the same time as doing something practical. 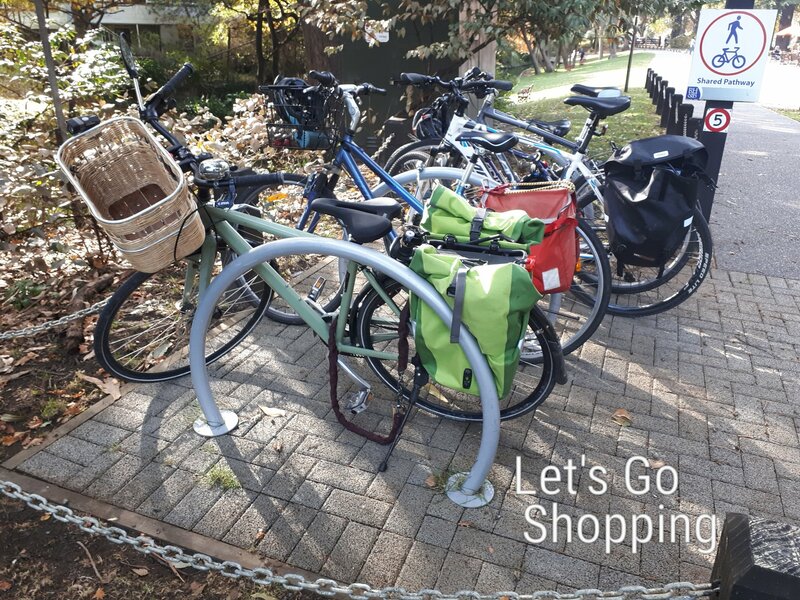 It is especially important for local businesses to be involved; it is generally known that those who ride bikes tend to shop more often, more locally and spend just as much as anyone else. This is beneficial for local neighbourhoods; a good local economy keeps services accessible for all. We know that local businesses are always sensitive about car parking in their area; by showing them that people on bikes are also good customers, there will be less resistance to the perceived threat of a cycleway coming to their area. Who will be the lucky businesses this year? 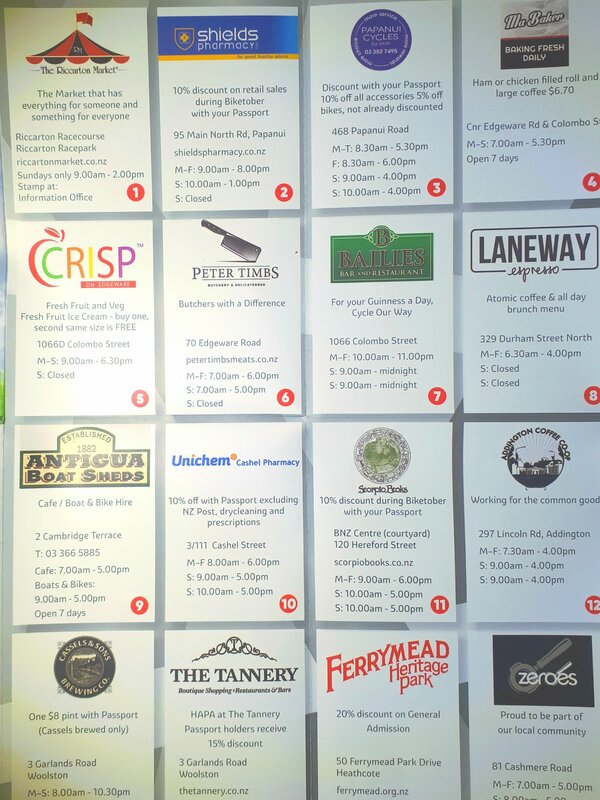 Last year 16 local businesses participated in the Passport Scheme, 10 located in the CBD, or near the Papanui Parallel Cycleway. The majority reported (some with surprise) the good number of people who turned up with their Passport to be stamped. 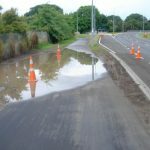 With the expected completion of the Heathcote Expressway Cycleway (Stage 1) and the Quarryman’s Trail Cycleway, there is good potential to expand the catchment much more widely. The Passport will now have up to 48 spaces for a business advertisement. There will be more (and better) prizes. Signing up a range of businesses has begun. So far, there has been sufficient verbal interest to fill nearly one quarter of the space available. Do you know of any potential cycle friendly businesses in your area who may like to participate ? Have a chat to them, talk about their business and how people on bikes turning up to shop can be good business. Get them (or you) to send an email to biketober@gmail.com and we can take it from there. Here’s to a great Biketober and a vibrant local bicycling economy in Christchurch. Did you use the Biketober Passport last year?